Sometimes my job is pretty cool and I get to test drive boats. In this case, the Highfield OM 390. Our models loved how lightweight the CL260 was. Here, they pull the boat onto the beach. Which brings me to last week. I was vaguely familiar with Highfield’s brand—we used their versatile CL260 Tender Series in our 2018 swimsuit issue, so I saw firsthand how light the aluminum-hulled inflatable was. The boat was so lightweight that I saw three models pull the CL260 up the beach, unassisted. But the boat was also sturdy enough that one of our staff members towed an enormous inflatable slide out of the frame of a photo with it. But there were no models or slides in sight at Shake-a-Leg Marina in Coconut Grove, Florida. Just a lot of sun and four different Highfields of various sizes. I was lucky enough to get on the Ocean Master 390—which was quite a bit bigger than the one I had been on before. The Highfield OM 390 (12′ 10″) sported a 50-hp Honda outboard. Certainly powerful enough to ski behind, if the fancy were to strike, and more than enough power to get around as a tender when cruising. 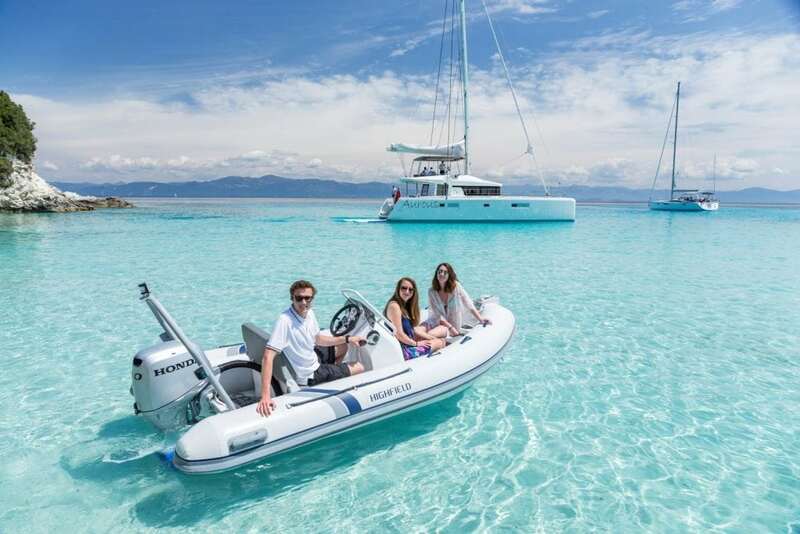 “You’d be surprised how many catamarans use Highfields as a tender,” said Highfield USA’s General Manager Tom Watson. 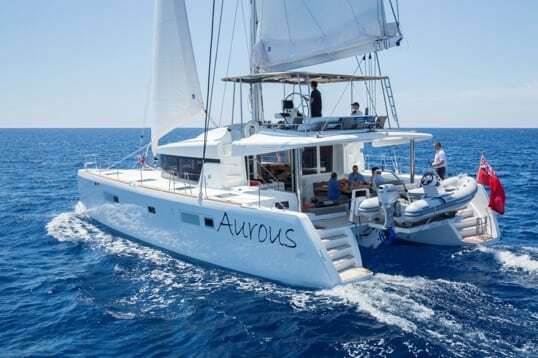 But it makes sense—catamarans, whether power or sail, are favored by long-range cruisers who require something lightweight, durable, and maneuverable, be it for trips to shore or exploring a beach. A lightweight boat also means less fuel to lug around. Plus, Highfield has integrated their fuel tank into the boat, which means no more tanks taking up foot space. Since the fuel intake is located in the bow, it’s very easy to nose up to the fuel dock or an onboard storage bladder. Part of the Highfield lineup at Shake-a-Leg marina. It helps that the OM 390 is easy to handle. I drove the boat up a stretch of the Miami River and was pleased to see how well it handled with a newbie at the wheel. It happened to be the first day of mini-season, so we hovered under a span of the Rickenbacker Causeway to see if we could spot any lobsters. While I didn’t see any bugs, I did see how nicely the OM 390 reacted to passing wakes, some of which were rather large. Note the Highfield OM 390 on the stern of this catamaran. “Stability is key,” said Watson. “That’s in part due to our aluminum hull design, and in part to the 20-inch deadrise.” Indeed. I was hoping to get splashed (it was 90+ degrees, after all), but I remained woefully dry. I can’t say I disagree—we’ve said it before, and I’ll say it again: RIBS are a do-it-all wonder. Especially if it’s a Highfield. Learn more about the entire Highfield line at highfield.com, like them on Facebook and follow on Instagram.